Indonesia's presidential candidate Prabowo Subianto gestures as he speaks during a debate with his opponent Joko Widodo, not pictured, in Jakarta, Indonesia, Feb. 17, 2019. Mugiyanto remembers very well how the event that nearly cost him his life unfolded in March 1998. “We thought the place was safe, but on March 13, I discovered no one was home and our laptop was gone,” he told VOA. “All I could think about was ‘I’m dead,’” he said. Under Indonesian President Suharto’s 31-year rule, many activists were allegedly kidnapped in an attempt to silence them. Mugiyanto and others who survived believe Prabowo Subianto, Suharto’s former son-in-law, who is running in the presidential race against the incumbent Joko “Jokowi” Widodo, was involved in the kidnappings. 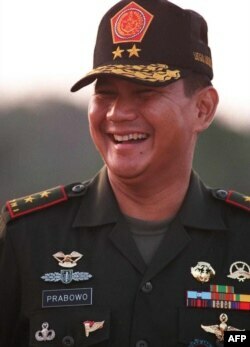 FILE - Indonesian Major General Prabowo Subianto, photographed Sept. 14, 1996, while head of the elite Kopassus unit, during a military exercise in the Natuna islands. “Every time I didn’t give a satisfactory answer they would beat me up,” he said. He managed to get a glimpse of his captors’ uniforms when his blindfold was removed to take his photo. That’s when he saw the Indonesian Army Special Force logo. Mugiyanto is adamant that Subianto was involved because he was the general commander of the special force in 1998. 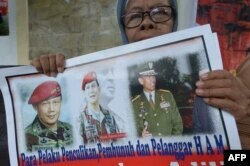 Along with other survivors and families of missing persons, he publicly declared at a press conference his support for incumbent Jokowi. “But it’s not just that. There were investigations conducted by different agencies, including the National Commission for Human Rights, the Military Honor Council. ... Third evidence was when the Honor Council decided to terminate him from the military service,” he explained. Subianto has also been denied visas to visit the United States, telling Reuters in 2012 that the denials were based on allegations he had instigated riots that killed hundreds after Suharto’s ouster. He denies wrongdoing. The spokesperson of Subianto’s campaign team, Andre Rosiade, says the issue of past human rights violations is being politicized for the presidential election. Rosiade says there was no proof that Subianto was involved in the kidnapping and he was never put on trial or indicted. Hendri Satrio, a political analyst and the founder of public opinion polling agency KedaiKOPI, says the issue of human rights will not put a damper on Subianto’s electability. He says the problems that are being considered in the minds of Indonesian voters are the economy and legal issues. “Human rights issue is crucial and we must pay attention to it. But for the majority of Indonesians it is not an indicator whether to vote for a leader or not,” he told VOA. Presidential candidate in next year's election Prabowo Subianto, right, a retired special forces commander, and his running mate Sandiaga Uno attend a ceremony at the election commission headquarters in Jakarta, Indonesia, Sept. 21, 2018. Satrio adds that the issue of past human rights violation should be over since the General Election Commission approved Subianto’s candidacy. “The activists and families of victims should’ve raised the issue long before Prabowo became a presidential candidate,” he said. Meanwhile, Miftah N. Sabri from Subianto’s campaign team believes this issue was brought up because Jokowi’s campaign team is not ready to sell the current president’s achievement. “It’s like a broken record, they keep bringing it up. It doesn’t affect us,” Sabri said. According to the latest survey by the Indonesian Newspaper Kompas, the electability of Prabowo Subianto and his running mate Sandiaga Uno increased by 4.7 percent within six months to 37.4 percent. Jokowi and Ma’ruf Amin, however, saw their electability decreased by 3.4 percent to 49.2 percent. FILE - An Indonesian protester holds a placard featuring Prabowo Subianto, center, reads, "Doers kidnapping, killing and human rights violators" during a protest against presidential candidate Prabowo Subianto in Jakarta, Indonesia, May 20, 2014. “They should ask what he has done in four years,” he added. Mugiyanto says for him, the choice is easy: “I don’t want to vote for someone who has committed a crime and I think Jokowi still has the good intention to solve human rights cases that happened in the past,” he said. “But if Prabowo wins, that would delegitimize all the efforts and sacrifice by the pro-democracy movement in Indonesia that finally managed to overthrow the New Order in 1998,” Mugiyanto said.